Tauranga (Pop: 101,000) is New Zealand's 6th largest city, located of the western Bay of Plenty on the east coast of the North Island of New Zealand. Located 205kms southeast from Auckland, 105 km east of Hamilton and 85 km north of Rotorua, Tauranga - meaning "Sheltered Waters", is the largest residential and commercial area of the coastal Bay of Plenty region. Tauranga is located at the head of a large harbour which extends along the western Bay of Plenty, and is protected by Matakana Island. The town and headland of Mount Maunganui stand at the entrance to the harbour, five kilometres north of Tauranga. "The Mount", as it is known, is often regarded as a satellite town of Tauranga, although it is technically a suburb. Its is one of the major resort cities in New Zealand, famous for its beautiful beaches. With its fertile lands and pleasant climate making it the centre of a large kiwi fruit and citrus growing area. With pride is its colonial heritage with Gate Pa battle site and Otamataha Pa Military Cemetery and its scenic views including the McLaren and Omanawa Falls. Tauranga is New Zealand's catering for business, international trade, culture, technology, fashion, science and entertainment. It is home to renowned institutions covering a broad range of professional and cultural fields, and is one of the most substantial economic places, with the largest port in New Zealand, the Port of Tauranga. 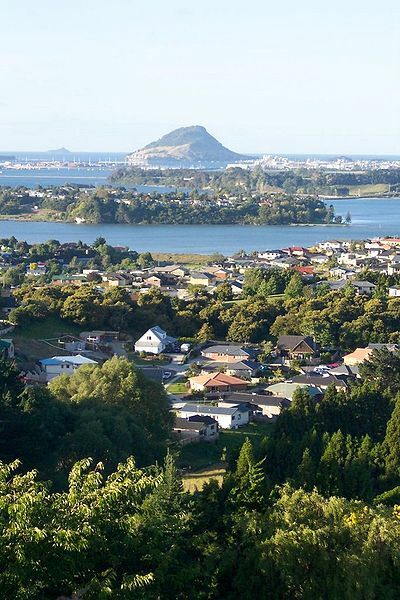 Tauranga's suburbs and other areas include The Avenues, Matua, Tauriko, Otumoetai, Bethlehem, Greerton, Ohauiti, Brookfield, Maungatapu and Welcome Bay, and the northern coastal strip of Mount Maunganui, Omanu, Arataki, Bayfair, Papamoa and Papamoa East. Tauranga Festival is held February/March and the National Jazz Festival is held at Easter. Tauranga is served by regular daily coach and bus services from Tauranga to Auckland, Hamilton, Rotorua, Napier, Gisborne, Hastings, Palmerston North and Wellington. Air New Zealand Link operates regular daily air services to Auckland, Wellington, Rotorua, Taupo and Christchurch. There are no passenger train/rail services from Tauranga to Auckland, Hamilton, Rotorua, Taupo, Gisborne, Napier, Hastings, New Plymouth, Wanganui, Palmerston North or Wellington.